This shirt appears to only be available on the beta to characters who have not completed the Broken Shore questline, but are level 100 and eligible to do the Legion scenario. Looks like the npc that sells it, Lenny "Fingers" McCoy is gone once the Harbor goes back to it's normal unphased state. His coords are 28.6, 27.5 Stormwind Harbor. That's right next to a stack of crates as you're approaching the dock that takes you to the Broken Shore. At the time I'm writing this, purchasing/equipping the shirt does not add it to the transmog closet. I've reported this as a possible bug. This shirt is the spitting image of the now-unavailable Fine Cloth Shirt. I strongly suggest, in case the NPC doesn't stick around when the event ends, picking yours up for 80g rather than what could later be exorbant AH prices. At the time of this writing, the item is bindable and a green item once again, as well as unique. As such, you can only have one in your bank and/or inventory at a time. While it was originally impossible to search for 'Lucky' and find it in your list, it now shows up as the 'Fine Cloth Shirt' if you search for 'Lucky Shirt'. The lucky shirt is only white (common) quality, not green or higher, so it doesn't get added to your appearances collection. Confusingly, I see this shirt on the vendor as a green item. The CanIMogIt and Caerdon addons both told me it was learnable. I equipped it, and both addons told me it was added to the appearances collection. However, I do not see it when I search for "lucky" in the shirt section of the appearances tab. More bizarrely: My wife sees the item as an unlearnable white item. Even when I bought a green one and tried to trade it to her, she saw it in her trade window as a white item. My sense is that a hotfix is in progress but either isn't complete or doesn't fully resolve the problem. Darn you, life... I just hear about this shirt AFTER experiencing the epic ! EDIT: Today it is again green and BoE, and I could add it to my transmog collection by equipping it. Don't know why Blizzard made this no longer transmogible... only going to piss off more Alliance players that Horde has 3 Toys and a cosmetic "hidden" boot, while Alliance only get the Allania, or whatever it's called, bonnet. If you see the shirt as an unlearnable white item, try exiting the game, deleting your Cache folder, and restarting. By doing this, the shirt turned into a learnable green item for me. However, even after doing that, and seeing the CanIMogIt addon marking it as "Learned," I cannot find the shirt in my shirt collection when I search for "lucky". I took a screen shot of the shirt then went through all the transmogs available (ones I have and ones I don't have). 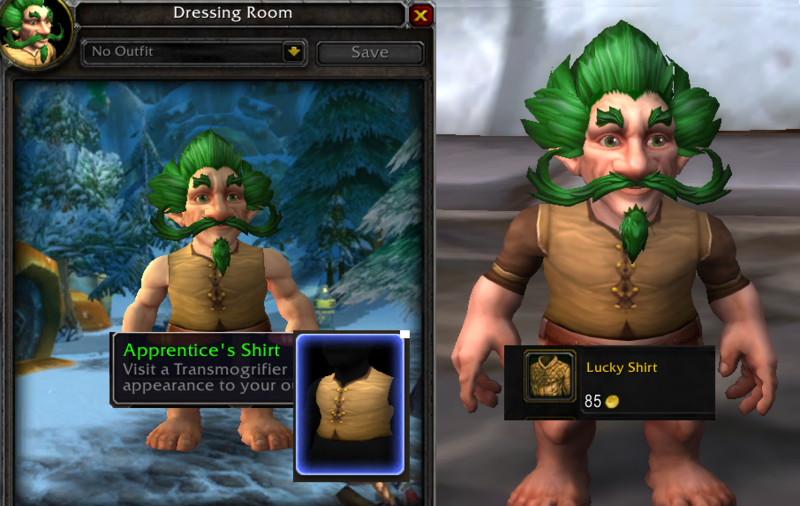 The closest transmog available (after I equipped the Lucky Shirt) is the Apprentice's Shirt. The Apprentice's shirt is the same look as the Lucky shirt without the dark brown elbow length bits and the gold collar just above the brown elbow length bits. The main shirt part is identical colour, texture and features for the rest of the shirt. No other shirt comes close to looking the same. For those of you searching for this in your Appearances by searching for "Lucky", it shows up in mine as a Fine Cloth Shirt and not the Lucky Shirt. I honestly have no idea if this is because I completed the quest or if it just shows up under that appearance name instead. This should be called the "Sometimes Lucky Shirt"
I can confirm this does works, however will only last for a period of time. Ive had to delete it a day or so later to transmog it to a different appearance. Last night when i bought it, it was a BoE green learn-able item. Tonight its now a common item and can not be learned. Asked a gm about this item, why we can't add it to our collection. Got the answer. You've got it flagged in our system i can see from here, so." "It should add automatically when we resolve the issue, dont worry"
As of today (25 August) this shirt is green, BoE and learnable again. Don't know exactly when it happened, only just noticed. seems that shirts can be disenchanted now...just got from disenchanting this . and yes, it was green quality item, not white. just bought this...does it actually "do" anything or is it just a cosmetic item? This shirt was changed to a green (uncommon) Bind on Equip item in of 7.0.3. patches. Not sure which one. As of 28 Aug 2016. The shirt can still be obtained, and once equipped will show in your Appearance Tab. If you still need a Lucky Shirt Do NOT skip the quests. As soon as you pick up To Be Prepared, you're able to head over to the vendor Lenny "Fingers" McCoy and buy all of the items still. If you want to put a few away for later sale you can use an engineering mailbox an mail them to an alt or a a mount with a vendor. After buying each shirt you'll need to mail or vendor them. Once you have stocked up head head to a guild bank and buy them back one at a time to put them into storage. If you have DC issues, I'd advise against using the vendor method. If you're disconnected before buying them all back, you'll lose those shirts. The shirt and the toy were previously items that were only available during limited time events (such as the Legion Invasion Pre-patch event to purchase the shirt) and are now available for purchase at any time. Can confirm with other commenters, Lucky Shirt is now a green! :D Yay transmog! I bought this as a joke, put it on my toon, and went about my routine. While I was in Stormwind, a random person whispered me and just gave me 10000g out-of-the-blue. Didn't want anything in return. When I ran my daily Heroic, I got a Legendary proc out of a Soulwell. I know... a Soulwell! And that was just the first one. I got another Legendary from an Emissary box. While farming in Black Temple I got three --THREE-- Warglaives to drop. I'm not even sure if that's possible. I thought, "this is crazy!" but I got the Ashes of Alar next, and then Invincible from Icecrown. I had to log off, this was getting too creepy. But then when I checked my Banker toon, I found that the Blacksmith Hammer I had on the AH sold for 1299g. This is the luckiest Lucky Shirt in the whole world.